”Since 2015, we have performed two smaller studies at Uppsala University Hospital with more than 20 patients showing very promising results. If we can demonstrate that the method works in larger scale, we believe it can quickly become a new “gold” standard worldwide. 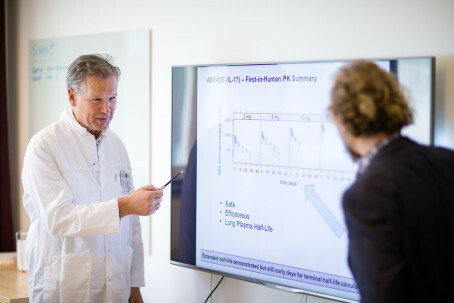 This would mean that difficult and stressful biopsies can be avoided for many breast cancer patients,” says Dr. Henrik Lindman, Physician at the Oncology Clinic, Uppsala University Hospital, who is running the study together with Dr. Jens Sörensen, Physician at the PET center in the hospital. “Several drugs effective against HER2 positive breast cancer have been available many years now. However, when selecting treatment, it is extremely important to know if the woman has HER2-positive metastases and how much HER2 protein is present on the cell surface. Our new method has two major advantages – you do not have to take tissue samples to get answers, an unpleasant experience for the patient, and we can also simultaneously map all tumors in the body,” says Dr. Lindman. The company operates a focused experimental medicine model and currently has four clinical or late stage preclinical proprietary programs. The first three are therapeutic programs that targets psoriasis, B-cell driven autoimmune diseases, and liver diseases respectively. The fourth program is a diagnostic imaging program that is directed primarily towards metastatic breast cancer.